Drill sergeants are part of Army lore: the tough-talking, stern taskmasters who turn recruits into soldiers. They rule boot camp with an iron fist and push new recruits to their limits. So it makes sense that training to be a drill sergeant is a rigorous process. Drill sergeant candidates, who are the top performers in their squads, are sent to Drill Sergeant Academy, where they go through basic combat training (boot camp) to re-learn every aspect of the training regimen. I will instill pride in all I train, pride in self, in the Army, and in country. I will insist that each Soldier meets and maintains the Army's standards of military bearing and courtesy, consistent with the highest traditions of the U.S. Army. Earning the "drill sergeant hat" begins with learning basic combat backward and forward. Because of the immense amount of responsibility being handed over to new drill sergeants, candidates must undergo extensive background checks as part of the drill sergeant qualification process. 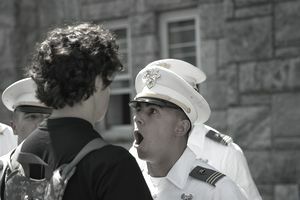 The typical day for a drill sergeant candidate begins with physical training, followed by a full day of academic training. Every topic is specifically targeted to the basic training environment. Classes consist of basic rifle marksmanship, drill and ceremony, unarmed combat training and a variety of other basic military skills training. The school’s overall goal is to train each candidate to become the trainer, be able to clearly and concisely relay what he’s learned to soldiers. Drill sergeant candidates also receive stress-management and personal relationship classes to help them in their future roles as mentors. These classes help students understand that each new recruit comes from a different background and some have no military experience. The confidence to be a drill sergeant and a mentor to other soldiers has always been held in high regard, and many seek the position as a stepping stone in their military careers. Others choose the road to drill sergeant school to have their own personal effect on tomorrow’s soldiers. Applicants must first take and successfully graduate from the basic non-commissioned officers (NCO) course and have a minimum of four years of continuous active service. You'll need to meet the height and weight criteria, and be able to pass the Army Physical Fitness Test. And all recruits for drill sergeant school have to be qualified with the M-16A2 within six months of submitting the application for drill sergeant school. In addition, drill sergeant candidates need a score of 100 on the general technical (GT) segment of the Armed Services Vocational Aptitude Battery (ASVAB) tests and hold the rank of staff sergeant or sergeant first class.